"TURTON, a township chapelry and a sub-district in Bolton parish and district, Lancashire. The chapelry lies 4 miles N by E of Bolton; contains Chapeltown and Oaks r. stations; and has a post-office under Bolton, a workhouse, and a cattle-fair on 4 and 5 Sept. Acres, 4,110. Real property, £13,678; of which £550 are in quarries, and £40 in mines. Pop. in 1851, 4,158; in 1861, 4,513. Houses, 855. The property is subdivided. There are numerous good residences. Industry is carried on in cotton-mills, print-works, bleach-works, an iron-foundry, and a paper-mill. Ancient British and Roman relics have been found. The living is a p. curacy in the diocese of Manchester. Value, £161. Patron, G. M. Hoare, Esq. There are four dissenting chapels, several public schools, and charities £30. The sub-district includes two other townships, and comprises 7,080 acres. Pop., 5,459. Houses, 1,024." Details about the census records, and indexes for Turton. You can also perform a more selective search for churches in the Turton area or see them printed on a map. The Register Office covering the Turton area is Blackburn. Ask for a calculation of the distance from Turton to another place. "CHAPELTOWN, a village in the parish of Bolton le moors, and county of Lancashire, 3 miles N. of Bolton. It is situated on the Blackburn railway." "EGERTON, a small place in the parish of Bolton le Moors, in the vicinity of Bolton, county palatine of Lancaster." "TURTON, a chapelry in the parish of Bolton le Moors, hundred of Salford, county Lancaster, 4 miles N. of Bolton, its post town, and near the Chapel-town and Oaks railway stations. It is situated on the Roman way to Manchester, and is bounded by two rivulets tributary to the Irwell. Many of the inhabitants are employed in cotton mills, dyeing, bleaching, and print works. There are also numerous stone quarries. The land is principally in pasture. At a farm called Turton Tower is an ancient structure of four stories, formerly the residence of the Chethams, Orrells, and Greames, but now a farmhouse. The living is a perpetual curacy in the diocese of Manchester, value £161. The church, dedicated to St. Ann, has a stained E. window, and was built in 1840. The parochial charities produce about £31 per annum. There are day and Sunday schools for both sexes. The Independents, Presbyterians, and Unitarians have chapels. J. Kay, Esq., is lord of the manor. A fair is held on the 4th and 5th September for cattle and horses." "WALMSLEY, a chapelry in the parish of Bolton-le-Moors, hundred of Salford, county Lancaster, 4 miles N. of Bolton." In 1835 Turton was a township in the parish of Bolton. 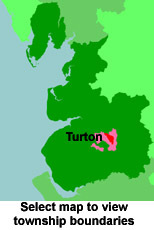 You can see the administrative areas in which Turton has been placed at times in the past. Select one to see a link to a map of that particular area. A description of Turton in the 19th century. View maps of Turton and places within its boundaries. For probate purposes prior to 1858, Turton was in the Archdeaconry of Chester, in the Diocese of Chester. The original Lancashire wills for the Archdeaconry of Chester are held at the Lancashire Record Office.